Chantal is incredibly proud of her business and what she has achieved, despite the fact she never had the opportunity to go to school, and cannot read and write. Well in case you aren’t familiar, Togo is a finger of country (38 miles wide and 284 miles long) in East Africa sandwiched between Ghana and Benin. 50% of the population lives below the poverty line making it one of the world’s poorest countries. Shockingly, one in eight children will not reach their fifth birthday, and two in twenty people will die from malaria every year. IADES (Institution D’Aide Au Developpement Economique Et Social) is one of our newest Field Partners and based in the capital, Lomé. They are a not-for-profit association whose objective is to improve the lives of the poor, especially women, by providing them with an opportunity to work their way out of poverty. With less than 5% of the population having access to a bank account, Togo is the perfect example of how microfinance can make a significant difference to people’s lives. Chantal Sika, 33, didn't go to school and can't read or write. She owns a succesful hardware store in Lome, Togo (serving approximately eight customers every 45 minutes). Through a system she developed herself, she can visually reconigse when enough money is enough. Education is only compulsory for six years and the system suffers from a severe lack of trained teachers. Many families cannot afford to pay for school fees or uniforms which leads to significant dropout. As well as malnutrition and a lack of education, gender inequality is a huge issue in Togo. Ranked 162nd out of 188 countries in the 2015 Gender Inequality Index (GII), Togo is one of the worst countries in the world for women to live in. Women can subjected to female genital mutilation, arranged marriages and generally speaking, are expected to carry out the vast majority of manual labour for the family household. Whilst there, I met a lady called Chantal Sika, who is 33 years old and mother to Eric (9), Emilie (7) and Daniel (4). Chantal runs her own hardware store, selling paints, sewing tools and construction materials. It’s a busy store in the heart of Lomé, serving approximately eight customers every 45 minutes, that she set up after receiving a £192 loan. Until recently, Chantal's son Eric, was not able to go to school. Instead, he helped look after his brother and sister while his parents worked 12 hours a day, 6 days a week to scrape by. "I learn from [IADES]. The most recent session taught us the importance of using mosquito nets," explains Chantal Sika. Chantal, hardware store owner attends social and business training sessions as a beneficiary of a loan from IADES (Deki's partner in Togo). 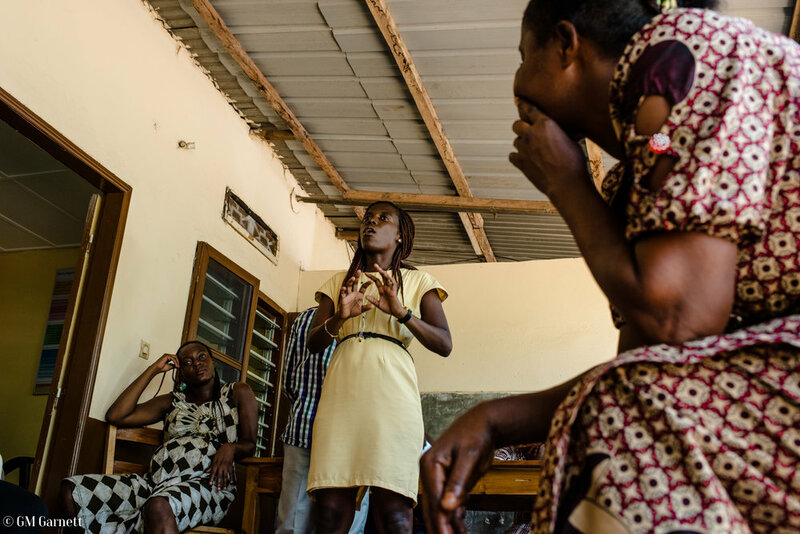 IADES provide workshops on business practice, gender equality and domestic violence to strengthen the community of women who receive 90% of IADES’ loans. We're building a new website. A website that will empower women to change their futures, just like Chantal. A website that will create so many more inspiring stories. But we need your help. We are raising £5,000 to kick-start the process. Donate today and start changing the world. Through training she received from Deki’s field partner IADES she has developed a system to enable her to visually recognise when enough money is enough. She tells me she has also learned how to wisely invest any profits made from her business and how to deal with competition. Since her loan Chantal has started to send Eric and his siblings to school and can now feed them regularly with healthy and nutritious food. She wants her children to have a different childhood to the one she had. She wants them to be able to choose their future and go to university if they want to. The children’s health has also improved as Chantal has learnt about how mosquito nets can reduce the chance of catching malaria. Eric, right, loves football. his favourite football player is Real Madrid's Sergio Ramos. Since going to school, Eric now helps his mother in the shop with reading and writing. He wants to go to university to make something of his life. It was so exciting to see first-hand the difference that a Deki loan has made. She continues to work hard and is focusing on expanding the business to stock a wider variety of goods. She also bought a sewing machine to enable her to offer clothing repairs. Chantal is just finishing repaying her loan and wants to apply for a bigger loan. She dreams of running a chain of hardware stores. She says ‘Our lives are better, little by little. Every month I put money aside so I can afford things for the children, such as toys and books’. By investing into her business Chantal’s loan will give her the opportunity to eventually buy her own land to build a house, improving the quality of life for her family, and giving them the opportunities she never had. I am also lucky enough to visit Eric and his siblings in school. Eric is the same age as my son, Patrick. As I talk to him about his dreams for the future, he laughs as he tells me he dreams of becoming a professional footballer. My son also dreams of becoming professional footballer. Except Patrick wants to play for Tottenham and Eric for Real Madrid. Patrick and Eric may have very different lives and opportunities as they grow up but no-one can stop their shared dreams being universal. Photography and captions by Georgina Mary Garnett Documentary Photography, and Adam Dickens of Taking Pictures, Changing Lives.